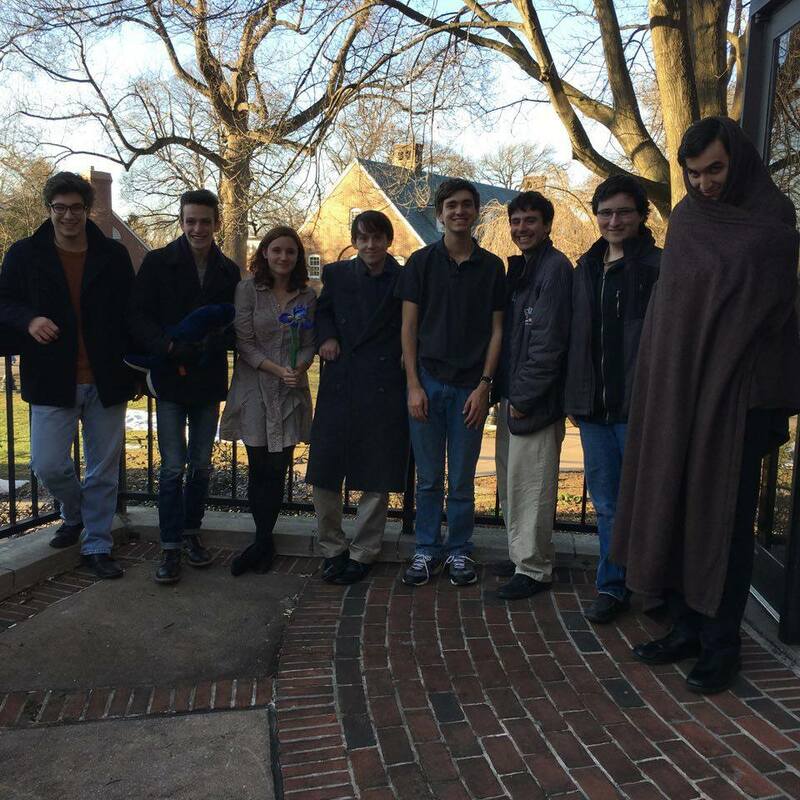 RUDU Goes to Georgetown: Wins Novice Finals, Leonard/Kropper Move to 5th TOTY! On the varsity side, Leonard’16/Kropper’16 performed extremely well! Leonard’16 got Third Varsity Speaker, and together he and Kropper made it to finals as Second Varsity Team! Although they ended up dropping the final round, their spectacular record at the tournament garnered them more TOTY points and shot them up to Fifth Team of the Year, in the entire country, after debating for a little more than a month! Congrats to Sean and Geneva! Temkin’18/Albert’19 shot through the Novice competition and won Novice Finals! Albert’19 got Second Novice Speaker and Temkin’18 got Third Novice Speaker. They achieved such high scores as novices that they were eligible for individual Varsity awards – a very great accomplishment that they seem to get quite often! Albert’19 was named Fourth Varsity Speaker – a stunning accomplishment – and Temkin’18 impressively got Ninth Varsity Speaker. Next week, the team will be debating at the beautiful University of Pennsylvania in Philadelphia on March 25-26. The past two weeks have been quite eventful for RUDU! The most recent tournament was at Temple University in Philadelphia, PA on March 11-12. Sean Leonard ’16 and Geneva Kropper ’16 surprised no one by debating exceptionally and garnering Third Varsity Team and getting Second and Fourth Varsity Speaker, respectively. In the novice competition, Max Albert ’19 and Pasha Temkin’18, our Vice President and President, got First and Second Place as Novice Speakers, AND broke to Varsity and was named Fifth Varsity Team! Albert ’19 and Temkin ’18 also were named Seventh and Eighth Varsity Speakers, respectively, which means that four out of the ten individual varsity speaking awards went to Rutgers, and two of the recipients were Rutgers novices! David Vinarov ’19 got his first speaking award, garnering Eighth Novice Speaker and winning Novice Finals with a debater from GW, while Jeremy Kritz ’19 was crowned Ninth Novice Speaker. RUDU was also reunited with dinos Deepta Janardhan ’14, Quinn Maingi ’15, and George Alukal ’15! RUDU enjoyed modest success at the West Point Tournament on March 4-5. Leonard ’16 teamed up with Andrew Bowles from George Washington and placed as Fifth Varsity Team. Albert ’19 got placed as Third Novice Speaker AND Sixth Varsity Speaker, and teamed up with Temkin ’18 to be crowned Third Novice Team. As Rutgers students enjoy Spring Break, our debaters will be preparing for a tournament at Georgetown this coming Friday and Saturday of March 18-19. Props to them for taking time out of their break to continue to keep Rutgers’ good name alive in the APDA community! RUDU Smashes It in D.C., Garners Top Awards at American U.
Leonard ’16 and Kropper ’16, both being crowned second and third best varsity speakers at the tournament, triumphed through all of their rounds and made it all the way to finals! In the final round, they dropped to Wang/Bowles from George Washington, which marks the second time in a row that the duo was crowned Second Varsity Team at a tournament! It is also the second time that they have debated together for Rutgers, and they are now ranked 9th Team of the Year! Meanwhile, our two exceptional novices Temkin ’18/Albert ’19 absolutely dominated the novice competition and won novice finals in the end! As for speaking awards, their records were so good that a coin toss needed to be performed to decide which one would be Top Novice Speaker and which one would be Second Novice Speaker, with Albert ’19 lucking out and getting the top title! Because of this, he also won Tenth Varsity Speaker. Next weekend, from March 4 – 5, the team will be at West Point! It will be a very interesting tournament. Treasurer Larry Feltz ’17 came along to judge. Each team did a fantastic job: Leonard ’16 and Kritz ’19 had a 4 -1 record and broke into out-rounds, while Kropper/Temkin and Albert/Vinarov both had the same 3-2 record, but only the former group broke. Leonard ’16 and Kritz ’19 made it to quarter-finals while Kropper ’16 and Temkin ’18 took one step further and made it to semi-finals! After this tournament, Kropper is also now qualified for nationals! The team was also reunited with former RUDU President, Quinn Maingi ’15! It was a great weekend. Next week, RUDU will be attending American University II’s on February 26-27. Last week, RUDU was happy to host a tournament and APDA meeting in our own New Brunswick. It was wonderful to be reunited with former members and we hoped that everyone enjoyed themselves! This past weekend of Feb. 12-13, RUDU traveled to Washington, D.C. to debate at George Washington University. We welcomed a new member, Geneva Kropper, who hails from University of Maryland and officially became a Rutgers debater recently. She got her future with RUDU off to an excellent start with her phenomenal debates this weekend with Sean Leonard ’16. After making it to finals and dropping to a team from Franklin and Marshall, the two placed as Second Varsity Team! Individually, Leonard ’16 garnered Third Varsity Speaker and Kropper was awarded Eighth Varsity Speaker. Pasha Temkin ’18 and Max Albert ’19 continue to do Rutgers proud by winning the title of Third Best Novice Team at the tournament. The pair also broke into the top ten for individual novice awards: Temkin’ 18 was awarded Seventh Novice Speaker and Albert ’19 was honored with Fourth Novice Speaker. Next week, the team will be headed to Lancaster, PA to debate at Franklin and Marshall!